Photo: Suzi Pratt Chef Dustin Clark presents a kimchi brined pork burger with sambal mayonnaise, American cheese, bread and butter pickle slaw at Feast Portland's Sandwich Invitational on Thursday, September 15, 2016. Photo: Suzi Pratt Deschutes Brewery serves a braised lamb shank sandwich and some of its many beers at Feast Portland's Sandwich Invitational on Thursday, September 15, 2016. Photo: Suzi Pratt Chef Sarah Schafer of Irving Street Kitchen served up a bacon kimcheese dog at Feast Portland's Sandwich Invitational on Thursday, September 15, 2016. Photo: Suzi Pratt Hendricks Gin serves up cocktails in a steampunk-inspired contraption at Feast Portland's Sandwich Invitational on Thursday, September 15, 2016. Photo: Suzi Pratt Chef Troy MacLarty of Bollywood Theater served up a crisp, slightly sweet yet savory Mumbai Monte Cristo at Feast Portland's Sandwich Invitational on Thursday, September 15, 2016. Photo: Suzi Pratt Feast Portland held its opening night event, the Sandwich Invitational, at the Rose Quarter near the Moda Center on Thursday, September 15, 2016. Photo: Suzi Pratt Attendees enjoy an Insane in the Romaine cocktail featuring romaine-infused Aviation gin, fresh romaine, lemon, simple syrup with bacon and tomato at Feast Portland's Sandwich Invitational on Thursday, September 15, 2016. Photo: Suzi Pratt Lines snaked around the entire outdoor venue of the Rose Quarter near the Moda Center on Thursday, September 15, 2016. Photo: Suzi Pratt Guests enjoy freshly shucked raw oysters and red sauce sliding down a chilly ice sculpture Feast Portland's Sandwich Invitational on Thursday, September 15, 2016. Photo: Suzi Pratt Chef Jeff Usinowicz of Deschutes Brewery served a braised lamb shank in oregano-manchego focaccia with Black Butte Porter cheddar heirloom tomatoes and pickled chile vinaigrette at Feast Portland's Sandwich Invitational on Thursday, September 15, 2016. Photo: Suzi Pratt A mint and strawberry mimosa greets bloggers at the Feast Portland Media Breakfast at Gracie's restaurant, located in Hotel deLuxe on Friday, September 16, 2016. Photo: Suzi Pratt Decadent Creations bakery samples the Drunken Pumpkin cake with hazelnut meringue buttercream at the Feast Portland Grand Tasting on Friday, September 16, 2016. Photo: Suzi Pratt In addition to many food and spirits vendors, the Feast Portland Grand Tasting also features 37 local wineries. Photo: Suzi Pratt The Solo Club serves up bites of Nicky USA exotic meats atop toasted bread at the Feast Portland Grand Tasting on Friday, September 16, 2016. Photo: Suzi Pratt As one of the region's prime cherry growers, Oregon Fruit Products sells canned and jarred cherries including this red tart variety that was highlighted at the the Feast Portland Grand Tasting. Photo: Suzi Pratt Attendees flock to the Williams-Sonoma booth for samples at the Feast Portland Grand Tasting on Friday, September 16, 2016. Photo: Suzi Pratt The Portland-based Jacobsen Salt Co teamed up with Williams-Sonoma for this dish of fresh tomatoes, a dash of salt and cheese at the Feast Portland Grand Tasting on Friday, September 16, 2016. Photo: Suzi Pratt Salt and Straw's ice cream cart had a long, steady line of fans sampling flavors at the Feast Portland Grand Tasting on Friday, September 16, 2016. Photo: Suzi Pratt Salt and Straw recently collaborated with Tom Douglas restaurants to create the Triple Coconut Creme Pie limited edition ice cream that was served at the Feast Portland Grand Tasting on Friday, September 16, 2016. Photo: Suzi Pratt Wiz Bang Bar, a spinoff of Salt & Straw ice cream, had limited amounts of this sweet tacolate at the Feast Portland Grand Tasting on Friday, September 16, 2016. The tacolate features a handmade waffle cone taco shell engulfing cinnamon and ancho chili ice cream, dipped in chocolate and topped with salt. Photo: Suzi Pratt A statue in the Pioneer Courthouse Square venue of the Feast Portland Grand Tasting holds a cup of Talenti gelato. Photo: Suzi Pratt A sampling of dishes prepared by Chef Doug Adams featuring the use of USA Pears at the Feast Portland Grand Tasting on Friday, September 16, 2016. Perhaps the most inventive tasting was a raw starkrimson pear with hot chile oil, black sesame, and toasted chives. Photo: Suzi Pratt Portland Chef Doug Adams poses for a photo at the USA Pears Grand Tasting booth at the Feast Portland Grand Tasting on Friday, September 16, 2016. Adams is a noted Top Chef finalist who just announced plans to open his own Texas-inspired restaurant, Bullard. Photo: Suzi Pratt Who says wine has to come from a bottle? The adult grape juice was free-flowing from various containers at the Feast Portland Grand Tasting on Friday, September 16, 2016. Photo: Suzi Pratt Attendees rest between tastings on the outdoor steps of Pioneer Courthouse Square at the Feast Portland Grand Tasting on Friday, September 16, 2016. Photo: Suzi Pratt Seattle restaurateur Tom Douglas and Portland chef Vitaly Paley speak on the mainstage at the Feast Portland Grand Tasting on Friday, September 16, 2016. Photo: Suzi Pratt A captive audience watches Seattle restaurateur Tom Douglas and Portland chef Vitaly Paley speak on the mainstage at the Feast Portland Grand Tasting on Friday, September 16, 2016. Photo: Suzi Pratt Attendees enjoy tastings from 37 local wineries at the Feast Portland Grand Tasting on Friday, September 16, 2016. Photo: Suzi Pratt Seattle Chef Brian Clevenger of Vendemmia and East Anchor prepares a tasting plate at the USA Pears booth at the Feast Portland Grand Tasting on Friday, September 16, 2016. Among the bites was a juicy chunk of porchetta with bosc pear, fennel pollen and frisee. Photo: Suzi Pratt Seattle Chef Brian Clevenger of Vendemmia and East Anchor poses for a photo at the USA Pears booth at the Feast Portland Grand Tasting on Friday, September 16, 2016. Photo: Suzi Pratt Piping hot paella by Scott Ketterman and his crew from Crown Paella cooks at Feast Portland's Night Market on Friday, September 16, 2016. Photo: Suzi Pratt Chef Jose Chesa of Chesa interacts with attendees at Feast Portland's Night Market on Friday, September 16, 2016. Photo: Suzi Pratt Chef Jose Chesa of Chesa served up cono with escabeche style duck, avocado, orange-sweet potato, crispy plantain and pimenton-garlic salt at Feast Portland's Night Market on Friday, September 16, 2016. Photo: Suzi Pratt Chef Alex Barkely of Seattle's Manolin served up albacore tuna with watermelon and quinoa at Feast Portland's Night Market on Friday, September 16, 2016. Photo: Suzi Pratt Chef Tyler Malek of Salt and Straw served up sweet corn copo: a lemon zest shaved ice with cilantro-kola syrup, black raspberry condensed milk, candied marionberries and sweet corn ice cream at Feast Portland's Night Market on Friday, September 16, 2016. 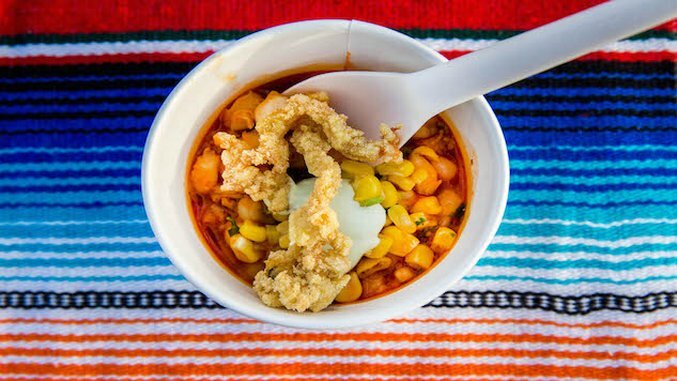 Photo: Suzi Pratt Chef Paul Kahan of Chicago's Dove's Luncheonette served up a bowl of pozole rojo at Feast Portland's Night Market on Friday, September 16, 2016. Photo: Suzi Pratt Portland favorite Jacobsen Salt Co incorporated its habanero salt into lime margaritas at Feast Portland's Night Market on Friday, September 16, 2016. Photo: Suzi Pratt Jacobsen Salt Co's crunchy, locally sourced crystals are the salt of choice for many Portland foodies and a staple ingredient of chefs throughout the Feast Portland Night Market on Friday, September 16, 2016. Photo: Suzi Pratt Sweet, freshly grilled corn topped with creme is served up at Feast Portland's Night Market on Friday, September 16, 2016. Photo: Suzi Pratt Jamie Curl of Quin served up fresh and fruity spiced lime candy on a stick at Feast Portland's Night Market on Friday, September 16, 2016. The chewy treat was reminiscent of a Starburst candy. Photo: Suzi Pratt Attendees eagerly wait to be admitted into Feast Portland's Night Market on Friday, September 16, 2016. Photo: Suzi Pratt Maylin Chavez of Olympia Oyster bar served up oysters on the half shell with agua chile rojo, pickled cactus leaves, avocado, and micro cilantro at the Feast Portland Night Market on Friday, September 16, 2016. Photo: Suzi Pratt A crowd favorite from Feast Portland's latin-themed Night Market was this juicy beef rib taco with hatch chili cheese sauce from Podnah’s Pit BBQ. Photo: Suzi Pratt USA Pears was a big event sponsor for Feast Portland and the main sponsor for the Night Market on Friday, September 16, 2016. Photo: Suzi Pratt Feast Portland's annual Night Market is a visual experience featuring a light-strung village of food stalls at the foot of some of Portland's most iconic bridges. Photo: Suzi Pratt Sailor Jerry spiced rum served up Mai Tizzy cocktails in whole coconuts at the Ring of Fire Feast Portland after party held at Irving Street Kitchen on Saturday, September 17, 2016. Photo: Suzi Pratt Smoked al pastor striploin was among the fixings at a build-your-own taco bar Ring of Fire Feast Portland after party held at Irving Street Kitchen on Saturday, September 17, 2016. Photo: Suzi Pratt Chef Sarah Schafer put together a molten cheese fountain so big it had its own hashtag, #NachoOrdinaryVolcano, at the Ring of Fire Feast Portland after party held at Irving Street Kitchen on Saturday, September 17, 2016. Photo: Suzi Pratt Never mind the fact that this afterparty happened right after the Smoked! main event! The Ring of Fire after party spared no expense with a tray of desserts and other treats on Saturday, September 17, 2016. Photo: Suzi Pratt Among the many photo-worthy attractions at Feast Portland's Ring of Fire after party was a whole pig's head dubbed #LordoftheFlies at Irving Street Kitchen on Saturday, September 17, 2016. Photo: Suzi Pratt The tiki-themed Ring of Fire Feast Portland after party also featured costumed hula dancers at Irving Street Kitchen on Saturday, September 17, 2016. Photo: Suzi Pratt Chef Vitaly Paley of Imperial in Portland serves up Snake River Farms pork cheek BLT lettuce cup at Feast Portland's Smoked! event on Saturday, September 17, 2016. Photo: Suzi Pratt Chef Carlo Lamagna of Portland's Clyde Common with LA's dessert queen Isa Fabro at Feast Portland's Smoked! event on Saturday, September 17, 2016. Photo: Suzi Pratt Chef Ben Bettinger or Portland's Laurelhurst Market serves up a smoked Oregon lamb shoulder with roasted carrot hummus, cucumber raita and pita crumbs at Feast Portland's Smoked! event on Saturday, September 17, 2016. Photo: Suzi Pratt Huge chunks of pork cook on an outdoor grill at Feast Portland's Smoked! event on Saturday, September 17, 2016. Photo: Suzi Pratt Pacific Coast Fruit Company serves up smoked heirloom tomato gazpacho topped with dill crme fraîche, preserved lemon and fried shallot at Feast Portland's Smoked! event on Saturday, September 17, 2016. Photo: Suzi Pratt Portland favorite Nong's Khao Man Gai serves up her famous grilled chicken and rice with Enoki mushroom salad at Feast Portland's Smoked! event on Saturday, September 17, 2016. Photo: Suzi Pratt Smoked! is easily a Feast Portland crowd favorite due to its visual appeal. Nearly all of the 25 featured chefs were grilling up a storm outdoors, making for perfect photo opportunities. Photo: Suzi Pratt Crisp, juicy pork sits on a grill at Feast Portland's Smoked! event on Saturday, September 17, 2016. Photo: Suzi Pratt Christine Flynn of Toronto's iQ Food Co and Stephen Gerike of Churchill's National Pork Board serve up backbone stew with tasso and braised greens, along with a pork backbone gumbo at Feast Portland's Smoked! event on Saturday, September 17, 2016. Photo: Suzi Pratt Smoked! is easily a Feast Portland crowd favorite due to its visual appeal. Nearly all of the 25 participating chefs were grilling up a storm outdoors, making for perfect photo opportunities! Photo: Suzi Pratt Attendees braved rainy drizzles at Feast Portland's Smoked! event on Saturday, September 17, 2016. Photo: Suzi Pratt Chef Andy Ricker of famed Thai restaurant Pok Pok poses for a photo at Feast Portland's Smoked! event on Saturday, September 17, 2016. Ricker served a fragrant, flavorful Northern Thai sausage known as sai oua. Photo: Suzi Pratt Chef Philippe Boulot of The Multnomah Athletic Club served a black plum charred albacore tuna with grilled corn and chanterelle salad at Feast Portland's Smoked! event on Saturday, September 17, 2016. Photo: Suzi Pratt Chef Katy Millard of Coquine served a decadent chocolate chip cookie with salted caramel and smoked almond at Feast Portland's Smoked! event on Saturday, September 17, 2016. Photo: Suzi Pratt Chef William Werner of San Francisco's Craftsman and Wolves served a Douglas Fir smoked meringue with blackberry conserved lime curd and smoked butter crumble atop a scoop of Tillamook authentic sweet cream gelato at Feast Portland's Smoked! event on Saturday, September 17, 2016. Photo: Suzi Pratt All day rain didn't stop a sold out crowd from flocking to Feast Portland's final weekend evening event, Smoked!, on Saturday, September 17, 2016. Photo: Suzi Pratt Mimosas with champagne and fresh Oregon fruit are served at Feast Portland's Brunch Village on Sunday, September 18, 2016. Photo: Suzi Pratt Abraham Conlin and Adrienne Lo of Chicago’s Fat Rice serve fios de ovos (Thai egg threads with fish sauce, maple, bacon and chilis) at Feast Portland's Brunch Village on Sunday, September 18, 2016. Photo: Suzi Pratt Seattle Chef Rachel Yang, fresh off the opening of her first PDX outpost Revelry, serves an Asian-inspired tamale at Feast Portland's Brunch Village on Sunday, September 18, 2016. Photo: Suzi Pratt Johanna Ware of smallwares served up congee with black bean sausage, honey, black vinegar and scallions at Feast Portland's Brunch Village on Sunday, September 18, 2016. Photo: Suzi Pratt Elias Cairo of Olympia Provisions put out a nice array of meats including Greek loukanika salami at Feast Portland's Brunch Village on Sunday, September 18, 2016. Photo: Suzi Pratt Attendees enjoy brunch in Pioneer Courthouse Square at Feast Portland's Brunch Village on Sunday, September 18, 2016. Photo: Suzi Pratt The Solo Club serves up an ethnic fusion rice tamale featuring fernet-coke braised pork and nuoc cham at Feast Portland's Brunch Village on Sunday, September 18, 2016. Photo: Suzi Pratt Attendees load up on food and drinks at Feast Portland's Brunch Village on Sunday, September 18, 2016. Photo: Suzi Pratt Little T Bakery serves up crisp, twice-baked croissants with plum filling at Feast Portland's Brunch Village on Sunday, September 18, 2016. Photo: Suzi Pratt Chef John Gorham of Toro Bravo served up a pimento, egg and fried chicken biscuit sandwich at Feast Portland's Brunch Village on Sunday, September 18, 2016. From September 15 to 18, foodies flooded the streets of Portland, Oregon in celebration of the city’s premiere food and wine event: Feast Portland. As its name suggests, Feast is a, well, feast of an event. Without surprise, all Feast events were sold out and crowds turned out to every event, even when the weather turned sour on Sunday night. Feast kicked off on Thursday night with the Sandwich invitational. Featuring the sandwich creations of 15 chefs from Portland and around the country, crowd favorites included the crisp Mumbai Monte Cristo from Chef Troy MacLarty of Bollywood Theater. But a panel of judges ultimately bestowed the title of best sandwich upon the Bulgogi Club from Portland Korean BBQ truck Kim Jong Grillin. Among the best and most popular booths was the one hosted by USA Pears, featuring a chef-curated menu centered around pears with wine pairings by Chateau Ste Michele. “Top Chef” finalist Doug Adams was behind the helm on Friday, while Seattle chef Brian Clevenger was Saturday’s special guest. Operating under a Latin-inspired theme this year, Feast Portland’s second main event transformed Zidell Yards’ gravel floor into a festive dance party with 19 chefs. Culinary highlights included a Costa Rican sweet corn copo from Tyler Malek of Salt and Straw, and a juicy beef rib taco with hatch chili cheese sauce from Podnah’s Pit BBQ. By the last full day of Feast, Portland’s warm, sunny weather dissipated into typical Pacific Northwest rain that fell all day. But even that couldn’t put a damper on the final night event of the weekend: Smoked! The second-annual cookout featured 25 chefs from Portland and around the country firing up their outdoor grills and cooking up everything from skewered quails, guinea hens, pork shoulders, and much more. Local favorites included Andy Ricker of Pok Pok, Nong Poonsukwattana of Nong’s Khao Man Gai, and Gregory Gourdet of Departure. Other chefs from outside of Portland included Nina Compton from New Orleans-based Compère Lapin, Christine Flynn of Toronto-based iQ Food Co, and Jason Alley of Virginia-based Pasture, to name a few. Perhaps the tastiest bite of the night came from Clyde Common chef Carlo Lamagna and his Filipino bites of grilled quail served with vegetarian pancit. The final event of Feast’s 4-day colossal celebration was, appropriately, a massive Sunday Brunch. Essential staples were of course present including a build-your-own Bloody Mary bar, a spread of meats from Elias Cairo of Olympia Provisions, and a sumptuous egg and fried chicken biscuit sandwich by John Gorham of Toro Bravo. There were also deliciously creative ethnic dishes including congee by Johanna Ware of smallwares and an Asian-inspired tamale by Seattle chef Rachel Yang (fresh off the opening of her first Portland outpost). Some of the most fun and buzzworthy events of Feast Portland are the ones that aren’t on the schedule. There are After Parties and even After After Parties to keep the Feast buzz going all weekend long if you please. Among the most noteworthy was the closing night tiki-themed Ring of Fire after party at Irving Street Kitchen. Featuring boozy rum cocktails served in whole coconuts, a molten cheese fountain in the shape of a volcano, meat-laden taco bar with a whole pig’s head in the spotlight, and tropical hula dancers, this was the best send-off for a weekend of feasting.